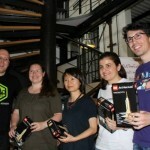 The Hackathon in Hamburg took place recently with the motto “For a better working life”, and several Goodgamers were there to test their programming skills. At such events, participants have 24 hours to work on a project together. The aim is to produce demonstrable results before the time runs out, and ideally a finished and functioning product. In Hamburg, the 80 participants, of whom more than half were women, sat together in small groups to discuss their projects and work together on their tasks. Some opted to work on beanbags or benches in the open air – the atmosphere was relaxed and casual. 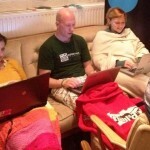 The Hackathon started early on Saturday and hacking continued until Sunday afternoon. Goodgame Studios were supporting the event, and we were there running a smoothie bar where participants could pick up a free dose of vitamins. Our colleague Lamis and her team developed an app called Lunch Minutes, a restaurant platform for companies. 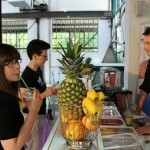 Using the app, every employee would be able to share their order with others, who could then join in with the order. The project was awarded a prize. Benjamin from our PHP department and his team were also pleased to receive a prize. They developed a survey app for companies to use in market research. The user gets a certain amount of virtual currency per answer submitted, which can then be donated to a good cause. Benjamin was one of the few who stayed up over night developing and writing code. His recipe for staying alert: “I kept myself awake with lots of coffee and energy drinks. The feeling of success when something worked was also a big incentive.” Our colleagues really enjoyed the event: interesting tasks, likable people and functioning apps after only 24 hours. Bring on the next Hackathon.